When Darshita Thakker and Irina-Marcela Nedelcu enrolled in Drexel LeBow’s MS in Business Analytics program, they expected to delve into topics like programming, text mining and social network analytics through their courses. What these two recent master’s graduates didn’t anticipate was that they would teach lessons in these same topics to a growing audience of middle school students – in some cases, not long after they had learned the concepts themselves. 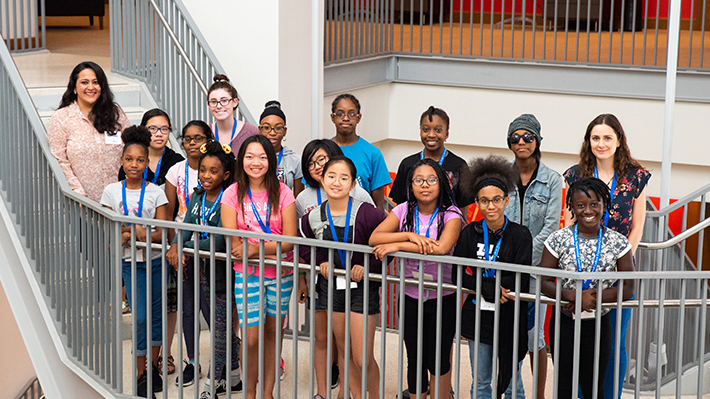 Part of LeBow’s partnership with TechGirlz, a Philadelphia-based STEM-focused nonprofit, this side venture grew to encompass much of their time outside of class and their internship, and ultimately proved to be a highlight of their studies at LeBow. Though Thakker had previous teaching experience – working on art projects with children – teaching technology was a new space for her. Still, she and Nedelcu both leapt at the chance to involve young girls in topics and ideas that could orient them for future studies and careers. “Seeing that type of female leadership, and from people who are in the field and practicing these concepts, is so powerful for the middle-school girls,” Jones adds. The last of LeBow’s workshops for the school year – on social network analytics, with ideas and themes taken from the Harry Potter series of books and films – had the highest attendance of any that TechGirlz has held. “They offer over 200 workshops a year right now, so it was really impressive to hear that,” Thakker says. Though Thakker and Nedelcu completed their master’s degrees in March, they both want to stay involved in future workshops, including a camp being held at LeBow this summer. “We really want to hold onto this,” Thakker says, though she notes that new professional commitments, propelled by her studies in analytics, come first. Lotus Barron is busy as a double major in marketing and business analytics, but she takes time twice a year to lead educational discussion sessions with girls from Southwest Philadelphia.